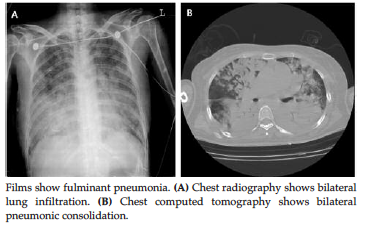 Herein, we report a rare case of severe respiratory syncytial virus pneumonia after kidney transplant in a 46-year-old woman. The patient was diagnosed with end-stage renal disease and underwent living-donor kidney transplant. Direct flow cytometry crossmatch testing yielded positive results, and desensitization treatment with rituximab, plasmapheresis, and im-munoglobulin was performed before transplant. There were no complications. Five days after discharge, the patient was readmitted with a 2-day history of fever and diagnosed with bilateral pneumonia. The patient was placed on mechanical ventilation and given renal replacement therapy. Respiratory syncytial virus in the bronchial washings was detected via polymerase chain reaction. Broad-spectrum antibiotics, intravenous methylprednisolone, and immunoglobulin were admin-istered. Over-immunosuppression strategies, such as desensitization therapy, may result in severe respiratory syncytial virus pneumonia, even in kidney transplant recipients. It is well known that respiratory syncytial virus (RSV) may cause serious respiratory tract infections in newborns and young children. In adults, RSV pneumonia is rare except in elderly patients in long-term care units, patients with cardiac and pulmonary diseases, and severely immunocompromised patients.1 However, RSV infection is also rare in solid-organ transplant recipients, and, when present, the respiratory symptoms are typically mild.1,2 Herein, we report a case of severe RSV pneumonia in a patient who had recently undergone kidney transplant following desensitization therapy. A 46-year-old woman was diagnosed with end-stage renal disease caused by diabetic nephropathy and underwent living-donor kidney transplant from her husband. Human leukocyte antigen (HLA) com-parison with the donor was performed, and 5 loci-alleles did not match. Anti-human globulin-enhanced complement-dependent cytotoxicity crossmatches were negative. However, direct flow cytometric crossmatch testing yielded positive results, and the mean fluorescence intensity (MFI) ratio of the B cell was 6.6. 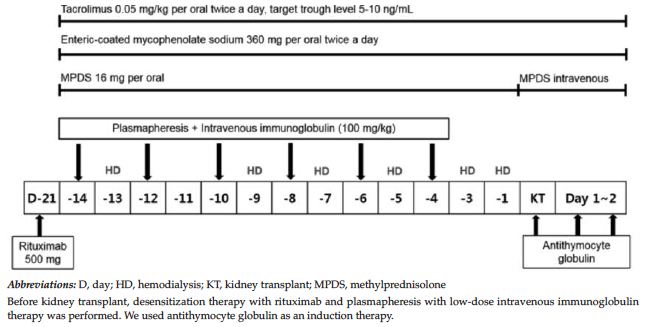 We performed desensitization treatment with rituximab, plasmapheresis, and immunog-lobulin before kidney transplant. The desensitization protocol of the patient is depicted in Figure 1. The patient was discharged without any posttransplant complications. Five days after discharge, the patient was read-mitted with a 2-day history of fever and diagnosed with bilateral pneumonia (Figure 2). The laboratory data were indicative of infection; specifically, we found elevated C-reactive protein, procalcitonin, and white blood cell counts. The patient’s initial vital signs were unstable. After oxygenation, her blood oxygen level was only 76%; therefore, we applied a mechanical ventilator. Because of the possibility of acute kidney injury by sepsis, the patient underwent continuous renal replacement therapy. Initially, we suspected bacterial pneumonia and Pneumocystis jiroveci pneumonia, which is an uncommon occurrence within the first month after kidney transplant. Broad-spectrum antibiotics, including sulfamethoxazole-trimethoprim and intra-venous methylprednisolone and immunoglobulin, were given to the patient. Because influenza A was prevalent during the time that the patient was visiting the emergency room, we also administered peramivir to the patient. Bronchial washings by polymerase chain reaction showed RSV (Table 1). The patient gradually improved, and ribavirin therapy therefore was not necessary. After 1 week, the chest radiography was completely clear, and the patient could be weaned from the mechanical ventilator. Allograft function recovered completely within 3 weeks after treatment (Figure 3). Anti-HLA antibodies are primarily expressed after exposure to non-self-antigens found in donor fluids or tissue after blood transfusion or organ transplant or during pregnancy.3 Once sensitization occurs, there is a high incidence of organ rejection and failure after transplant. The identification of suitable donor kidneys for transplant candidates with high levels of circulating antibodies against HLA is a major challenge, and sensitized patients have a reduced chance of receiving a crossmatch-negative organ. For many highly sensitized renal transplant candidates, an acceptable donor is never identified, and the patient remains on dialysis indefinitely. In an attempt to improve this situation, several desensitization protocols have been developed that can facilitate a positive crossmatch kidney transplant. Since 2000, the prevalence of desensitization treatment has gradually increased.3 In our case, we decided to perform desensitization treatment after determining that the patient was already sensitized. Generally, in direct flow cytometric crossmatching, an MFI ratio (sample serum/control serum) over 2.0 is considered positive.4 When we performed direct flow cytometric crossmatching with our recipient and her husband, the B-cell MFI ratio was 6.6. This indicated that she was highly sensitized and producing high levels of donor-specific antibodies. Therefore, desensitization therapy with rituximab, plasmapheresis, and low-dose intravenous immunoglobulin was performed. After kidney transplant, infection is a common cause of morbidity and mortality. Within the first month posttransplant, bacterial infections are common, whereas viral infections are not. Indeed, neither viral infection nor Pneumocystis jiroveci pneumonia commonly occurs.5 In the present case, we did not suspect RSV pneumonia because the symptoms occurred within a few weeks of kidney transplant. Respiratory syncytial virus infection is not common in healthy adults but does occur frequently in infants and very young children. It is not uncommon, however, for RSV to infect adults with cardiopulmonary disease or immunodeficiency and elderly people living in nursing homes.1 Patients with hematologic diseases who have had bone marrow transplant procedures show increased mortality after RSV pneumonia.2,6 However, solid-organ transplant recipients are less likely to become infected with RSV, and, if an infection does occur, the symptoms are typically mild.2 There are few reports of RSV pneumonia after kidney transplant. 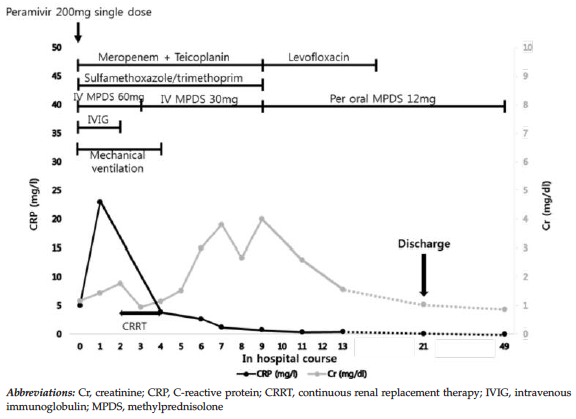 In only one case, the patient needed to be placed on a mechanical ventilator and treated with ribavirin (Table 2). Moreover, all patients survived after appropriate treatment.2,7,8 Fortunately, in our case, the patient survived despite the seriousness of her condition at initial presentation. Falsey AR, Walsh EE. Respiratory syncytial virus infection in adults. Clin Microbiol Rev. 2000;13(3):371-384. Englund JA, Sullivan CJ, Jordan MC, Dehner LP, Vercellotti GM, Balfour HH, Jr. Respiratory syncytial virus infection in immunocompromised adults. Ann Intern Med. 1988;109(3):203-208. Marfo K, Lu A, Ling M, Akalin E. Desensitization protocols and their outcome. Clin J Am Soc Nephrol. 2011;6(4):922-936. Kim Y, Han, B, Hyun J, et al. Evaluation of flow cytometric crossmatch results in comparison with donor-specific antibodies detected by luminex-pra tests in organ transplantation patients. J Korean Soc Transplant. 2012;26(2):92-100. McCarthy AJ, Kingman HM, Kelly C, et al. 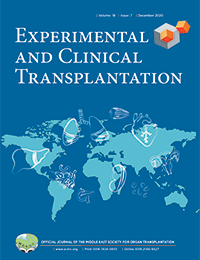 The outcome of 26 patients with respiratory syncytial virus infection following allogeneic stem cell transplantation. Bone Marrow Transplant. 1999;24(12):1315-1322. Peigue-Lafeuille H, Gazuy N, Mignot P, Deteix P, Beytout D, Baguet JC. Severe respiratory syncytial virus pneumonia in an adult renal transplant recipient: successful treatment with ribavirin. Scand J Infect Dis. 1990;22(1):87-89. Morales R, Kirkpatrick M, Browne B, Emovon O. Respiratory syncytial virus pneumonia in an adult renal transplant patient: an unexpected nosocomial infection. Infect Control Hosp Epidemiol. 2003;24(7):548-550. Anderson LJ, Dormitzer PR, Nokes DJ, Rappuoli R, Roca A, Graham BS. Strategic priorities for respiratory syncytial virus (RSV) vaccine development. Vaccine. 2013;31 Suppl 2:B209-215. Acknowledgements: This work was supported by a grant from the Korea Health Technology R&D Project through the Korea Health Industry Development Institute (KHIDI), which is funded by the Ministry of Health & Welfare, Republic of Korea (HI13C1232). The authors have no conflicts of interest to disclose. *Eun Song Lee and Kyu Yeun Kim contributed equally to this work.